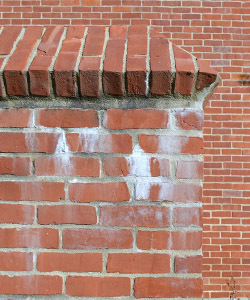 Efflorescence is a white, crystalline powder that has an irritating tendency to show up on new brick and block masonry. It’s irritating because it’s new masonry that architects and owners look at most closely. You can brush most of it away. It disappears when wet. But efflorescence will keep coming back until you do something about the conditions that create it. Brick, block and mortar must contain water-soluble salts. They usually do. Water, penetrating the masonry, sometimes carries in more soluble salts. There must be moisture in the masonry. There always is, particularly if the masonry has not been treated with a water repellent. There must be a way for the moisture to get to the surface. Moisture gets to the surface more easily in porous masonry, but it can always get there, thanks to the forces of evaporation. Take away any of these three conditions and efflorescence can’t happen. Moisture gets in the masonry from rain, the construction process or other sources. Salts –sodium, potassium or magnesium, for example – are dissolved in the moisture. In evaporating from the block, the moisture moves to the surface. The salts it carries don’t evaporate. They accumulate on the surface until you get that irritating white deposit. water gets in, the higher your risk for efflorescence. 2. Clean the efflorescence. Once you’ve determined the masonry is in good repair, and thoroughly dry, use a proprietary cleaner from a responsible manufacturer to clean away the efflorescence. The cleaner used depends on the type of masonry concerned. Colored brick and colored architectural block have specific requirements for cleaning. Contact a responsible manufacturer of masonry cleaners, or the manufacturer of the masonry itself. What ever you do, DON’T USE MURIATIC ACID to clean masonry. A note on muriatic acid: Use of muriatic acid as a masonry cleaner predates World War II. Then it was the only product available. Since then, developments in the kilning process of clay products, plus changes in types and number of additives in brick and concrete made muriatic acid obsolete and even harmful for masonry cleaning. Relatively recent advances in the overall construction industry such as colored mortars, aluminum windows and stainless steel trim have made muriatic acid even more undesirable for cleaning masonry. Don’t use it. that penetrate deeply into masonry pores, where they chemically bond with the masonry. water in. Without moisture in the masonry, efflorescence can’t occur.